The more you read about how to promote your website, what to do and not to do in link building, Facebook versus Google plus and all the other information that is out there, you can get sidetracked from your original mission of creating a successful website. Once you put those keys in the ignition, you want to drive from point A to point B safely, avoiding obstacles and not allowing distractions to get you in an accident. That’s how you really need to think about the progression of your website. All those distractions will continue to change as time goes by. If you get caught up in them and take your eyes off the road, you’ll never arrive at point B. The first thing webmasters are concerned about once their websites go live is getting people to it. All the links you can build and social networking you do won’t prove fruitful if people don’t like what they find when they get there. Slapping up an optimized page is not long term planning. You want to ask yourself whether people will really like that page when they get there. Will they want to return to the website after seeing it? Would they want to recommend it to their friends? If you don’t know the answer to that question, then the answer is probably no. That means you need to figure out how to achieve it. If you monitor the bounce rate of that page as you make improvements to it, you’ll know you’re moving in the right direction. Certainly, if people are back clicking from the page instead of clicking a link on the page to arrive at another page on your website, you are chasing them away. Take a good look at the websites that do it successfully for the same keywords you are pursuing. Are you missing something they offer? If so, find a way to do the same in an original fashion. Sometimes the problems on your website aren’t obvious. You might think you’re doing everything right, but there are www and non-www versions of your site or you have a bunch of broken links. Remember that a website consists of much more than people see. The pieces that make your site perform well in search are in the code and often not displayed to visitors. Use tools like the W3C validator to identify issues and fix them. Fix or remove broken links. Resolve the www, non-www issue to one variation. Visit webmaster tools and address the html issues, server problems, 404 pages, etc. that you find there. When you raise the standards of your site content, you’ll make it easier for social interaction to happen. Sharing junk on Facebook and Twitter won’t be very productive. When you arrive at point B, there will be plenty of time for sight seeing. Theresa Happe works with BuyDomains.com where you can buy a url for any website niche. If you are targeting only big keywords and ignoring long tail keywords altogether, then you might leave big money on the table. Most long tail keywords are actually buying keywords. Their low search volume indicates that only handful of people are searching very specific information about their problem. They are laser targeted, and if you ignore them, it means that you are ignoring big money maker potentials. Most PPC advertisers think that number one position will bring them more clients to their website. This is partially true. Yes, it will give you a chance to get more customers coming to your website, but it will also make you lose money very quickly. The cost per click in #1 position will be very high. It means that if you are not selling high ticket product, you might not be able to get reasonable profit from your campaign. It is always good to aim for the middle position, such as #3 or #4. You’ll pay cheaper price per click, and you still get good number of customers coming to your website. If you want to do PPC successfully, you have to prepare multiple ad copies in your campaign. But, most advertisers neglect the importance of landing page. Your landing page has to be relevant with the ad copy that you put in your campaign. In other words, you have to prepare multiple landing pages as well. At least, you have to prepare different landing page with different headline for each ad that you place in your campaign. Don’t let your affiliates to become your number one competitor in PPC advertising. If you have an affiliate program, there will be a big number of affiliates that will promote your product using PPC advertising. And if you don’t control them, they can beat you in this platform. For instance, if you don’t prevent your affiliates from placing an ad with your company or product name in it, you will lose potential sales because many sales will go to your affiliates .Remember that people looking for your product name or company name are ready to buy your product. The purpose of your ad is to entice your potential customers so that they are interested to visit your landing page. And remember, each customer that you bring from your PPC ads is a paid customer, so you don’t want to waste your money by writing ineffective ad copy. Your ad headline must contain words that grab people’s attention, and grow their interest toward your product. Then, the ad copy should be able to make people to decide to visit your landing page. Lastly, your landing page should be able to entice people to take action. Those pay per click management mistakes are common in most companies. Those mistakes are dangerous mistakes that can potentially thwart your investment in PPC quickly without much return. So, it is wise for you to avoid those mistakes and proceed in managing your PPC campaign with more caution. Deborah Dee blogs and writes about SEO and online reputation related topics. She works as a freelance writer in one of the leading SEO companies in Irvine. Google Analytics is a free tool which can be used to track information about your website visitors and how they interact with your site. You can also use it to monitor your keywords and determine whether or not your search engine optimisation campaign is successful. In this article we will explain how you can use the results of Google Analytics to improve your SEO campaigns. Keywords play an important role in all successful search engine optimisation campaigns. Your website’s Google analytics results will be able to tell you what keywords your visitors are typing into search engines to get to your website. This will help you identify whether your keywords are being optimised properly in your SEO campaign and whether you need to begin optimising new keyword searches, in line with those typed in by your visitors. Webmasters will also be able to identify the keywords which drive the most traffic to their websites. This may not necessarily be the highest converting keywords. Look at the highest converting keywords and determine whether or not you are optimising them properly in your SEO campaign. Monitoring keywords is an essential part of determining the success of an SEO campaign and is easy to do using Google Analytics. Whilst you need to know which keywords your visitors are using to get to your website, you also need to examine which search engines are sending the most people to your website. If this is not the search engine that you would expect then you perhaps need to tailor your campaign so your website is indexed by that particular search engine. Many webmasters aim to target Google in their campaigns. Google Analytics provides an in-depth report of your visitors enabling you find out things about them, such as where they are from and what browser they are using to view your website. Geography may play an important role in your search engine optimisation campaign so these results can be used to see if you are targeting specific geographical locations successfully. You should use this information to evaluate whether you can provide a better online experience for users from a particular area and find ways to engage with them on your website, in the hope that their visits will convert into sales. 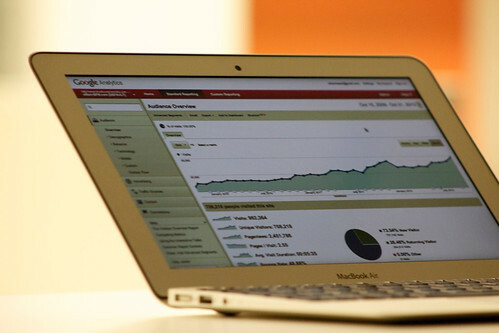 Google Analytics is an excellent tool to use for reviewing trends in organic traffic. Carrying this out will help you to evaluate your SEO performance over a chosen period of time. Webmasters should look to see if there is an upward trend in organic visitors and also check the proportion of new visitors. Effective search engine optimisations should aim to target new visitors, as well as returning visitors. One of the many advantages of Google Analytics is that you can choose to look at information between two dates, or examine a new report against an existing one. Webmasters should be looking at whether or not the information in the reports correlates with a new SEO campaign or changes that have been carried out on the website in order to make it more SEO friendly. Google Analytics has proved itself to be an invaluable tool for webmasters when it comes to determining the success of an SEO campaign. Despite being free to use its features rival, if not exceed some of the paid analytical software available on the market today. It also has a user-friendly interface making it easy for webmasters to use and understand. If you are looking to monitor your company’s SEO campaign and make changes for the better, then there is no better analytical tool to use. By Megan Hunt, who recommends St Albans SEO Company – Distinctly Digital and Google Analytics in your SEO campaigns.